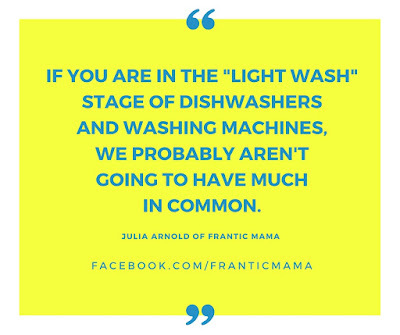 April has been off to a rough start in the Frantic Mama household. We returned from a wonderful family trip on a warm, sunny beach, to cold, rainy April weather. I had an annoying cold, and I could tell both of my kids had one brewing as well. Ugh. Then our furnace stopped working. Ugh again. In Minnesota, you still need your furnace to work in April. May too. My husband is fix-it-yourself-er, but after we were without heat for 3 days (and no homemade solutions were to be found) we called in the pros. The worker (of course) said we would likely need a new furnace, estimating around $5,000. But guess what? My husband researched and watched videos and in one last ditch effort, he fixed it! All he had to do was clean something. Yes, seriously. It works like a charm again and we called the company and told them we just saved 5,000 dollars. But by then my daughter's cold was raging-- a cough with a thick, runny nose-- the works. I also woke up feeling worse. She was home allllll day long with me from Monday afternoon to Thursday morning. We didn't even leave the house (except to run to the "bottle shop" [i.e. Trader Joe's liquor section]). This means no preschool for her, which means no writing or working for me. Ughhhhhh. This is when, yes, our water started acting weird. It sometimes works, and other times, nothing comes out of the faucet. Remember the movie The Money Pit, with Tom Hanks? That's how it's feeling around here. 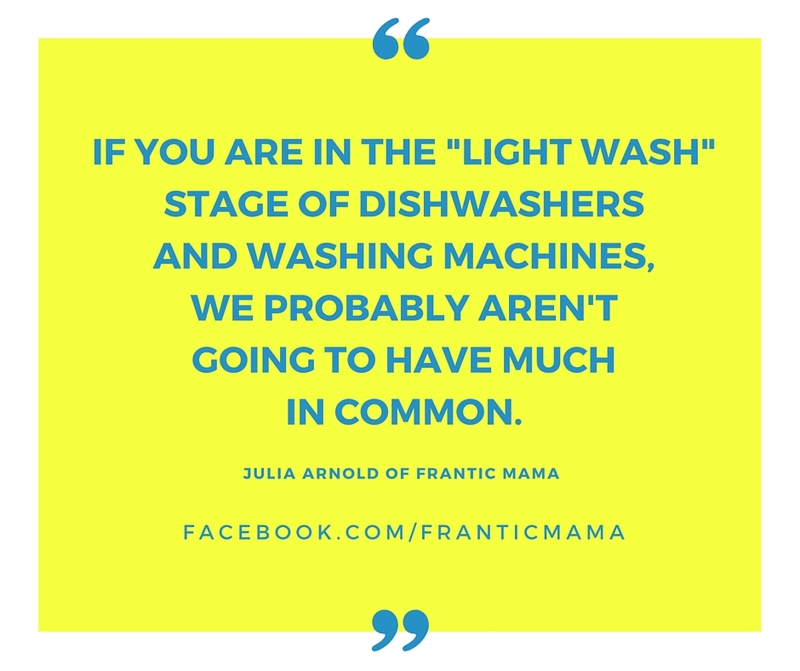 Everyone with kids knows that you need to run the dishwasher every day and the washer at least once a day to even attempt to stay on top of things. Needless to say, we're behind on clothes and dishes. Plus, it's still cold and rainy outside. And I'm still chugging DayQuil. Alas, all hope is not lost, though: my daughter was at least well enough to go to preschool this morning (all hail the power of preschool! ), hence this brief blog post in attempts to break out of my funk. How do you get yourself out of a funk? No one's going to do it for us, right? This blog post, an extra up of coffee (I used bottled water for that), and a handful of peanut butter pretzels is my big attempt to feel better! Oh Dear Julia....although I am feeling so bad for you....you STILL managed to make me laugh...OUT LOUD! Hope all continues to improve. I am thinking your handy hubby will get that water issue fixed by shear determination! Good for him!! Ah, thank you for thinking of me, Alice! I must admit, I also chuckled at the absurdity of it all as I was writing. I really don't know what I would do without writing-- it is my very best medicine. Oh, and you won't believe this: my son came home today from school with pink eye. And our water still isn't working! SOS! Are you guys on well water? Is your pump maybe going out? Thank you! April's been a wash around here. All the sickness, the weather, the house stuff-- ugh! It's a miracle I'm still clinging on to the last shreds of sanity here!! 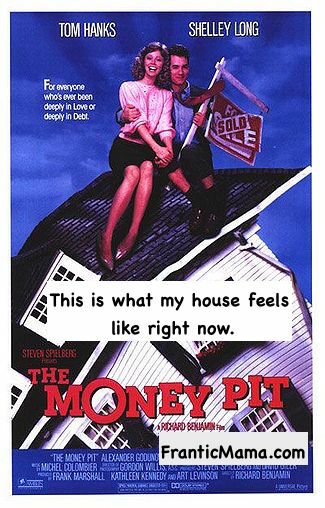 Yes, I think it is probably the pump (we do have a well), and we have a well specialist coming to the house today...fingers crossed he can fix it without draining our savings! You made it through all of it!! Laughter is such a survival skill! !I hope everything and everyone is on the mend. You gave Murphy's laws a fitting reply. Proud of you! May the funks now give way to flowers. I got late coming here. I am half, nah , three quarters drowned in packing and moving. And as you may well have guessed fractions are giving me and my boy a very hard time!!! Love the awesome awesome meme! You are funnier by the day!! Packing and moving with young children is so challenging! I am excited for you though, to move into a bigger space. It really does make a difference to be able to spread out and change the scenery during a long day at home simply by going up or downstairs!